When a ceramicist could not find a suitable soap for her handcrafted soap dishes, she started to experiment with making her own. And since she was creating the soap only for herself, she spared no expense and used only the finest ingredients. Today, the ambitious skincare concept is sold in more than 1,300 shops in 48 countries. 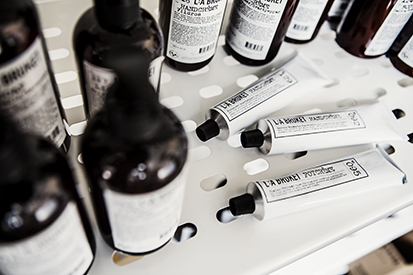 “It was back in 2008 and the selection of organic beauty and skincare products was very limited,” explains Mats Johansson, CEO of L:a Bruket, which he co-founded together with his wife Monica Kylén – the ceramist and visionary. Their idea was to create high-quality face and body care products, making no compromises on the ingredients. The couple is very much influenced and inspired by the spa traditions from the coastal town of Varberg, where they live, and by the harsh weather of the Swedish west coast. Using seaweed as a signature ingredient in the products is therefore no coincidence – the town’s residents have been taking saltwater and seaweed baths for generations. They vitalise and nurture your skin but also fuel your soul, giving you a renewed sense of energy and wellbeing. The ingredients of L:a Bruket’s range are all natural – medicinal plants, essential oils and raw vegetable ingredients.